Learn how we can know, trust and love the Bible, God's clear and sufficient word. The Bible stands at the heart of the Christian faith, but what do we really believe about it? Does it shape the way we think and feel and act? We all have questions about it. Can we trust it completely? Does it really contain everything we need for our complicated lives? Can we really know what it teaches, or just our own interpretation of it? And shouldn't we focus on Jesus, rather than the Bible? Kevin DeYoung tackles these issues and more with his characteristic wit and clarity - and without complex jargon. Unpacking what the Bible has to say about itself, he answers important questions raised by Christians and non-Christians alike. Come to understand more deeply the Bible's lasting significance. See its power to change our lives and move our hearts. Taking God at His Word will give you fresh confidence that the Bible really is worth knowing, trusting and loving. I bought this book hoping that it'd be a great, popular book that I could give to people about the Bible. The endorsements and hype were high, but when I sat down and read it, I just found it really rather boring. Kevin DeYoung can be a great author - funny, and ruthlessly Biblical - his book on Guidance, "Just do Something" is the best I know. But this book is dull. It is a book that contains much that is good to say about God's word, much that is wise, and it is thoroughly Biblical. Yet, when the subject is so important: God's Word, we must do everything we can to enthuse people about God's word. And that's why I won't be giving anyone a copy of 'Taking God at His Word'. I'd recommend instead: Barry Cooper's new book, "Can I trust the Bible?" That's the book I wish this was. In our increasingly non-Christian culture it is vital not only to know who and what we believe, but why we believe it. Every Christian therefore needs to be crystal clear on Scripture's doctrine of Scripture. 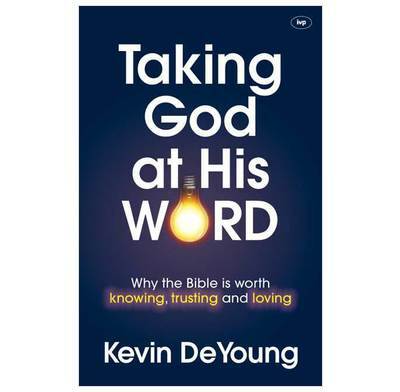 Kevin DeYoung's book is the place to begin shoring up (or putting in?) these vital foundations. Kevin starts with Psalm 119 and asks us straight whether we can echo what can seem such an over-the-top love poem for the Bible. His aim is that by the end of Taking God at His Word we will share the psalmist's love. Kevin then works through fundamental doctrines of the Bible including the sufficiency of Scripture (God's Word is Enough), the clarity of Scripture (God's Word is Clear), the authority of Scripture (God's Word is Final) and the necessity of Scripture (God's Word is Necessary). He calls Jesus' followers to have the same attitude to the Bible as Jesus did, ending with the challenge from 2 Timothy to stick with the Scriptures. At only 8 chapters, spread over just 124 pages, Taking God at his Word is not long. Crucially, however, this book is very very readable. Even more importantly it is readable for those who haven't been to university (though there is the occasional more technical term). If you want foot-notes and to read a theological book that makes you feel very clever because it is such hard work this is not it! Likewise, if you want a book that engages with all the various scholarly critical issues regarding historicity, form criticism, redaction criticism etc, this is not it either. But if you want a book that cuts under both by embodying what it teaches - that Scripture is sufficient, necessary, authoritative, final and clear - then here is the place to start. Then you will want to launch not only into Psalm 119 but also into the book recommendations in Kevin's appendix. 1. Buy it. 2. Read it. 3. Buy more. 4. Read it with your PCC/leadership. Shore up those foundations. We're just about to start stage 4.